Incorporating holiday decor pieces in your table design is a must at any party! 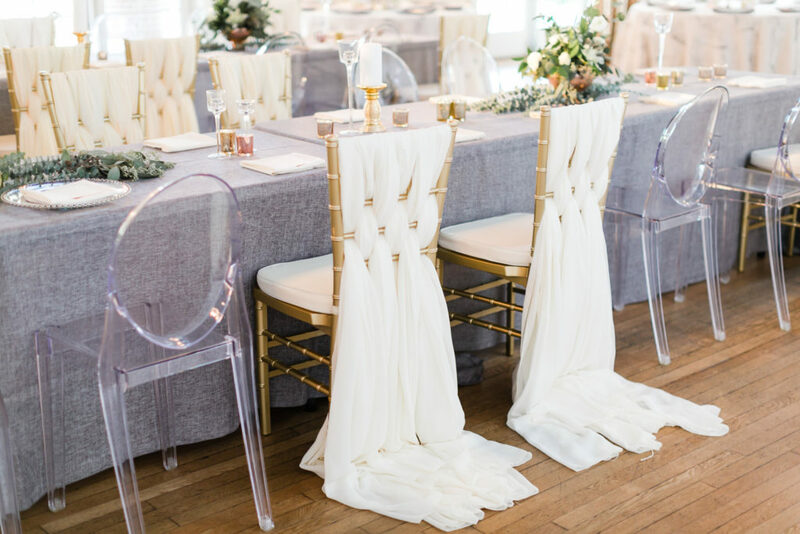 How cute are these wreaths on the back of the chairs in this photo? The touches of red and the small holiday tree figurines are simple touches that make the table festive, but not overwhelming! When it comes to holiday parties, we like when clients mix it up a little bit! Instead of opting for the traditional reds and greens for Christmas parties, you could use more neutral colored linens such as white and silver, and then use the more traditional colors as your accent decor! Everybody likes to feel like they’re in a “winter wonderland” sometimes! Is a holiday party even considered “fun and festive” without some sort of sequins?! We think not! How fun would our red sequins table linen be for a Christmas party dessert table? With so many different color options available, you could go all out at your holiday party with any of our specialty linens! If your holiday event has a sit down dinner, plate chargers are the perfect way to bring in some holiday color! Our red chargers would be awesome for a Christmas party while our gold or silver would look great at a New Year’s event! If you’re going for a more up-scale feel, our glass beaded chargers could be a great addition as well! Have fun planning or attending holiday parties this year! ‘Tis the season for big celebrations! Plate chargers are the perfect addition to any table! They can create a great layered look to your table, as well as provide an elegant and sophisticated touch to each place setting. We have many different plate charger options ranging from solid colors (gold, silver, red) to beaded glass (gold, silver). 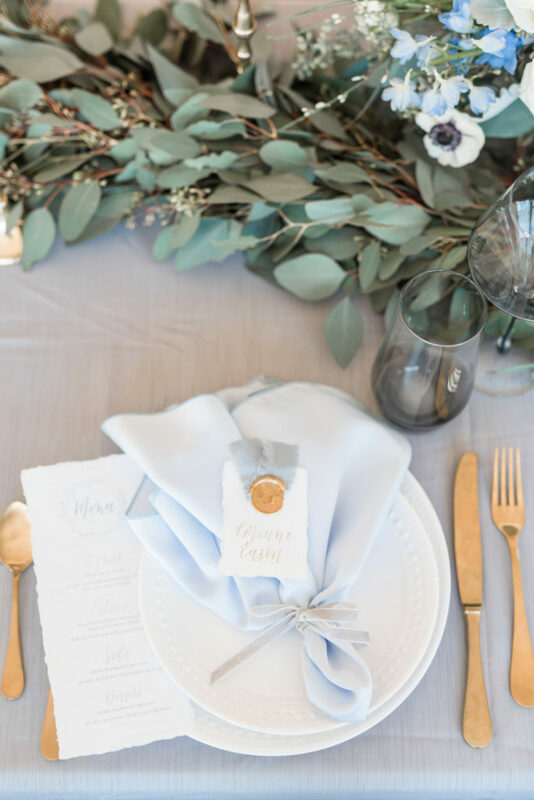 Although not technically on the table, chair sashes can be utilized around the table, so the detail they can bring is reflected as part of the table setting. Sashes can be rented in coordinating colors to your other event details and can be displayed with various ties. Check out the many different ties we offer here! Table runners, like table linens, provide the base for your whole table and the smaller details you place on top of them. The options for table runners are endless! Satin, pintuck, bright, neutral, sequin, specialty. . .you name it! We have the perfect table runner for you! Finally, napkins are one of the easiest ways to add a little color and creative detail to your table! With SO many color and fabric options, along with many different ways to fold them, napkins are a simple yet significant detail to add! 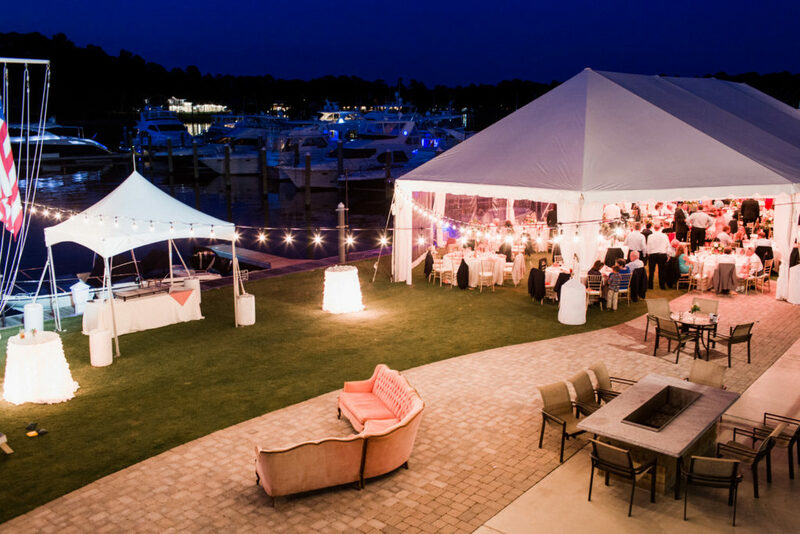 We hope our post today will help you out when it comes to choosing the perfect vendors for your event! Planning any event can be super stressful with all of the decisions that need to be made, and choosing vendors is one that many people struggle with. You may have narrowed your choices down to a handful of great options, but biting the bullet and deciding can oftentimes be very difficult. Check out some helpful tips and things to consider to help you find your perfect vendor matches! This one seems easy, right? Just pick the vendor/company who has the stuff you need. Well, not so fast! Of course you want to choose the vendor that has the inventory you want and need, but there are likely many different vendors who probably have what you need. So, since you have options, how do you pick the vendor with the right inventory for you? Find a vendor whose design aesthetic is similar to yours, that way when you decide to add on more items or change things up they will still have inventory that matches your design. Setting up a visit to their office or a design meeting are musts when picking out inventory because not all inventory is created equal! You need to make sure you love what you’re paying for! Whether it be on Facebook, or wedding websites like WeddingWire or The Knot, there are a ton of resources out there in terms of reviews! Just like you would look for restaurant reviews, you want to do the same for your event vendors! Hearing other clients first-hand experience with a particular vendor will make your decision easier! You probably know by now what your general design aesthetic is for your event and what kind of “planner” you are. You might be the type who has a bullet point list of pricing/tasks to complete, or perhaps you are more free form in your approach and aren’t sure of your whole vision yet. Knowing what kind of personality and attitude you have towards your event will help to inform what vendors would be a good fit for you. If you are the first type of person, you probably want a vendor who values efficiency and timeliness. The second type of person might need vendors who are able to offer a lot of different ideas and have time to brainstorm and dream. Coastal Virginia is such a collaborative area and many of the best vendors have the community over competition mindset, which is great news for you! Even vendors in the same industry work together often, offer advice, and refer other vendors when appropriate! Ask your current vendors if they have recommendations or if they have worked with particular vendors before. At Waterford, we love to sit down with our clients in design meetings and offer suggestions for you based on your personality type, style, and budget! 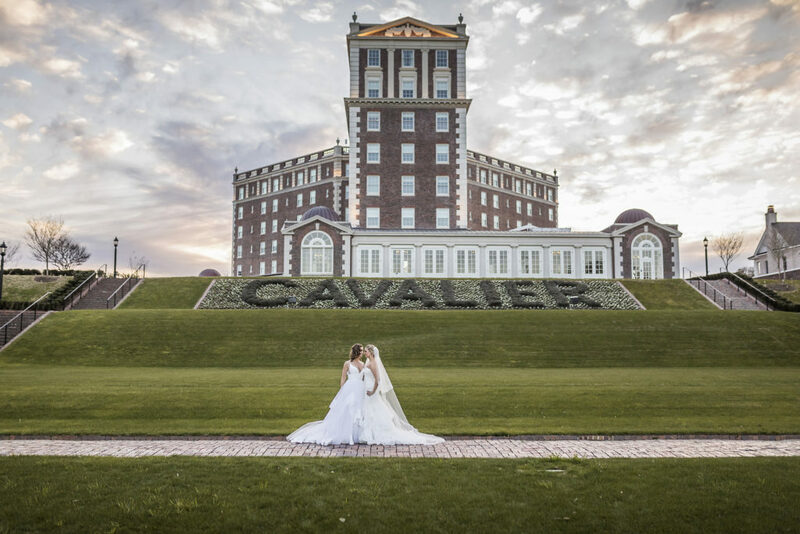 We were recently lucky enough to be part of an amazing styled shoot at The Cavalier Hotel, and we’re so excited to be able to share some images with you today! 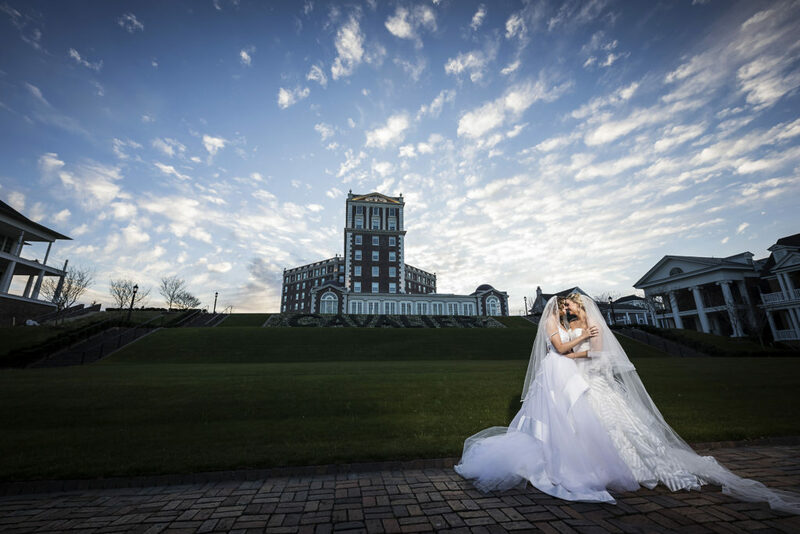 Working with Cherry Blossom Planning Factory and Misty Saves the Day on this shoot at the newly renovated The Cavalier Hotel was a dream! 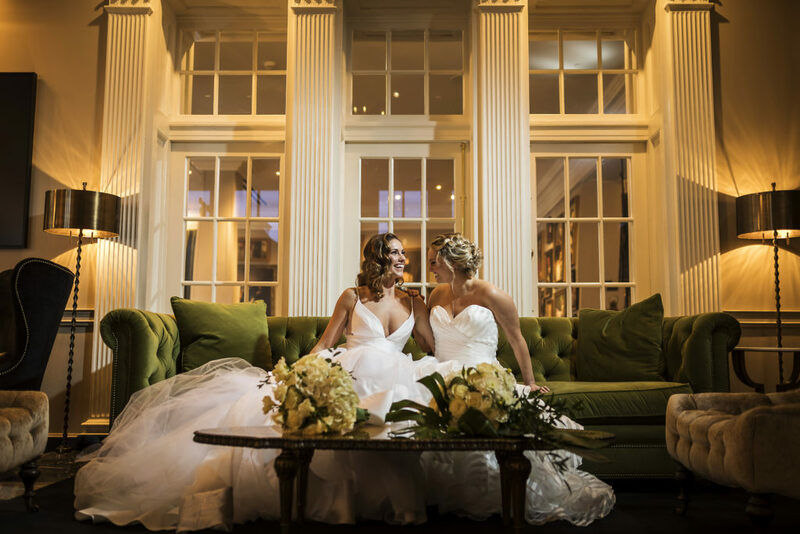 Not only was the whole style and concept of the shoot amazing, it was published in the Coastal Virginia Bride magazine! 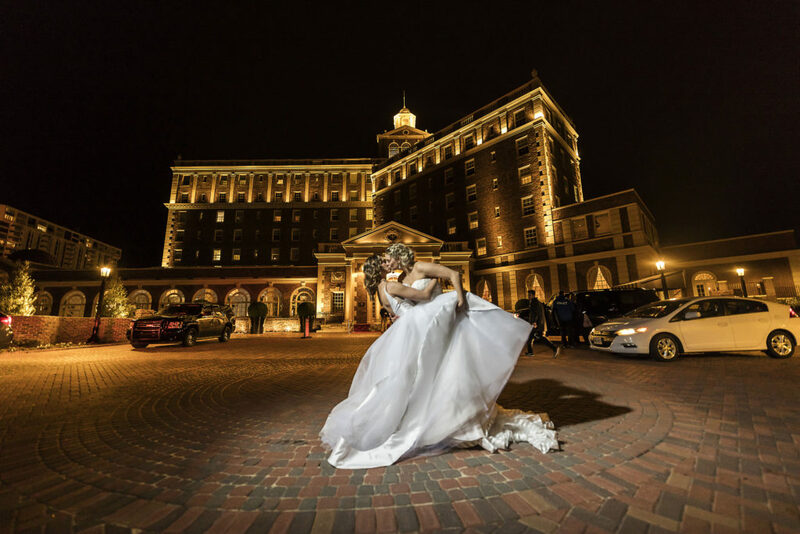 We’ll let the gorgeous photos by Dragon Studio do the talking below! 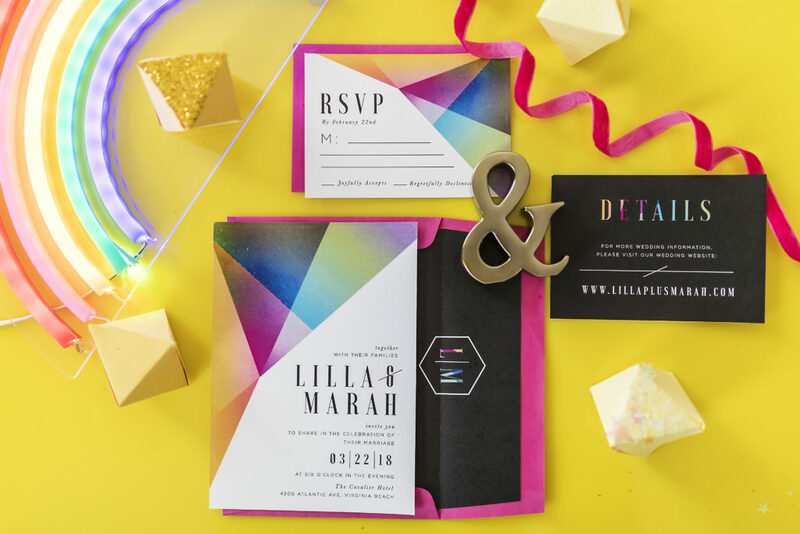 We absolutely adored all of the fun, bright colors used in this shoot! 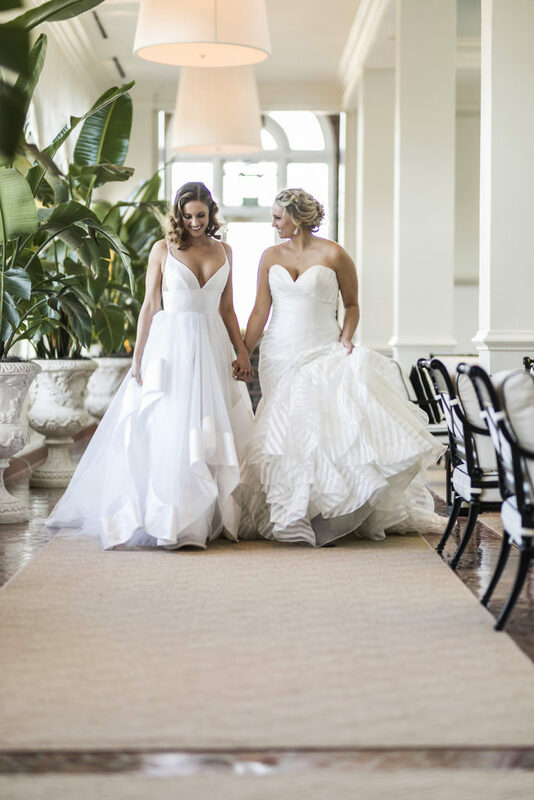 As we mentioned above, this was published in the Coastal Virginia Bride magazine, so make sure you check it out here! The shoot made the cover and six pages within the magazine. Two of our favorite linens were used for this shoot – petal and velvet! 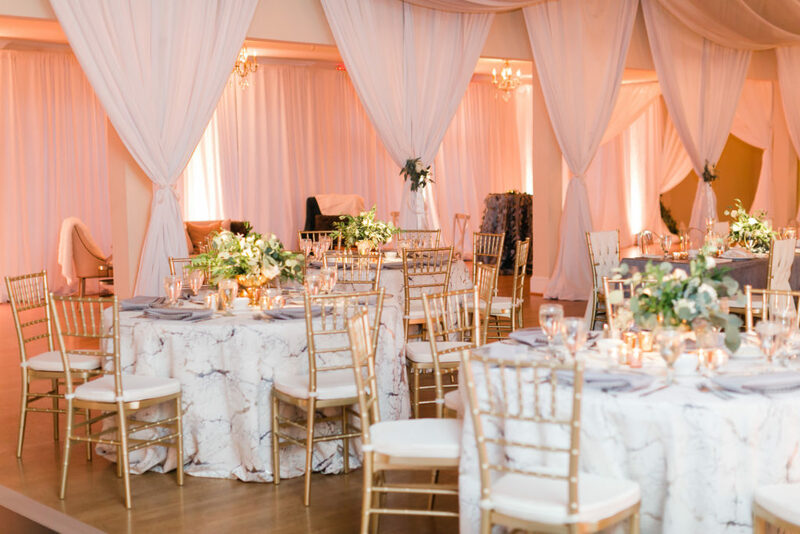 We loved the choice of using deeper colored linens in contrast to the brighter elements, and you can never go wrong with velvet! You can also head over to Misty Saves the Day to check out more photos! Choosing your linen colors is a big decision when it comes to planning your wedding. The color scheme you choose will set the ambiance for your wedding and will be incorporated into a lot of the aspects of your entire wedding. With that being said, choosing your linen colors should be a fun, not stressful, time for you! Today we’ve rounded up some tips that’ll make choosing your linen colors super simple! Ambiance is crucial at a wedding. Your table linen colors are the foundation of your wedding decor, so determining how you want your guests to feel is important. Decide which colors make you feel a certain way and give off the ambiance you want at your wedding! Generally speaking, each season comes with a universally recognized color palette. So, choosing colors that are popular in the season you’re getting married in is a great idea! These colors are strategically picked to compliment that season and weather. 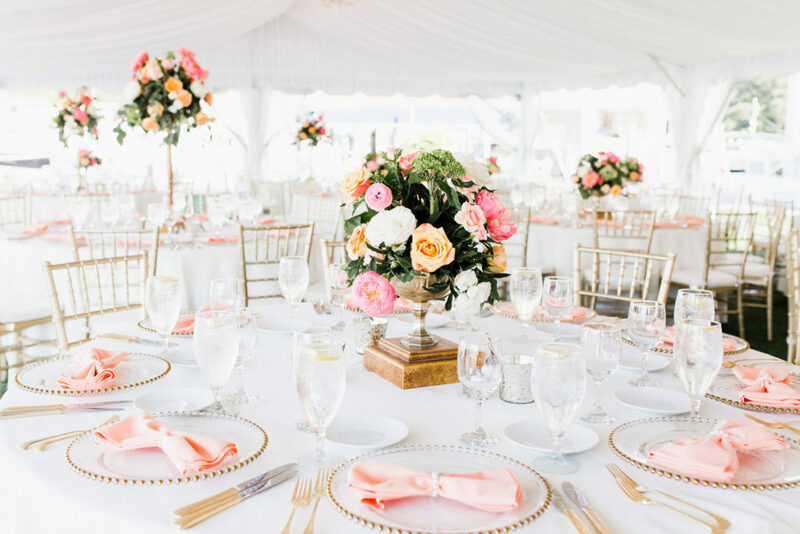 Looking at other seasonal weddings and color palettes are a great way to get inspired when you’re unsure what table linen colors or decor you want for your wedding. If you’re feeling uninspired or you need help narrowing down your options, Pinterest is the perfect place to get a wealth of ideas from! The different search possibilities are endless – colors, themes, decor, etc. 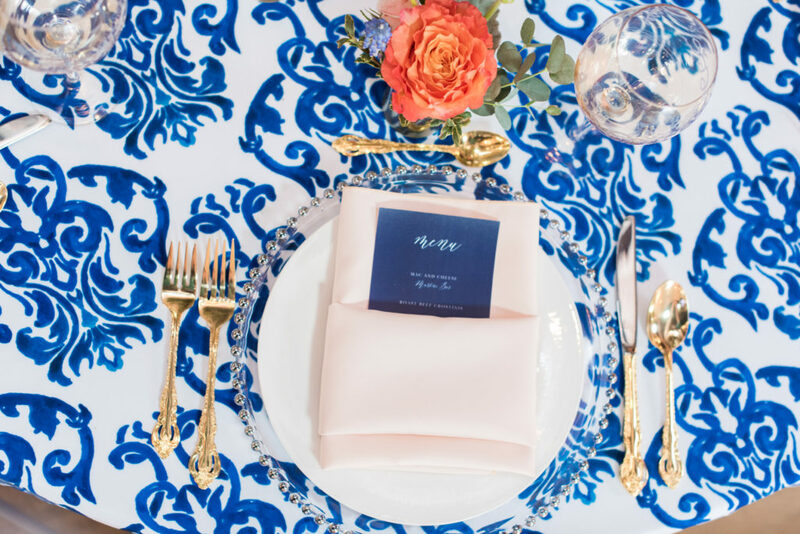 The chances of you finding a color combination or scheme that you’ll fall in love with is very likely and this will help you determine what table linen colors and accent colors will work for your event! 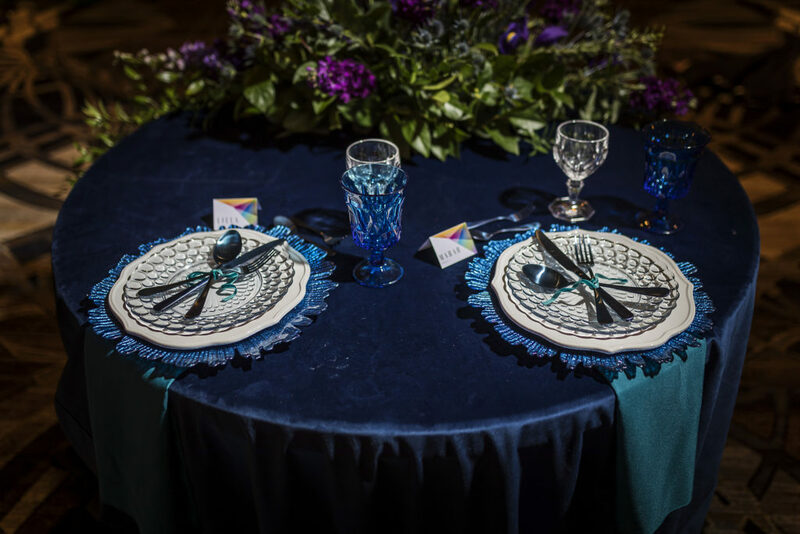 When looking into what table linen colors to choose for your wedding you want to keep your event space in mind. Thinking about what features and attributes you like and dislike about the venue is a good starting point! You’ll want to focus on complimenting and accentuating the traits you like with your linen colors. If you aren’t sure that you want as your primary color, think if you know what accent colors you would like to have. What color combination do you like? Do you want to go with more warm, cool, or neutral colors? It never hurts to play around as much as you need to until you find your dream color palette! 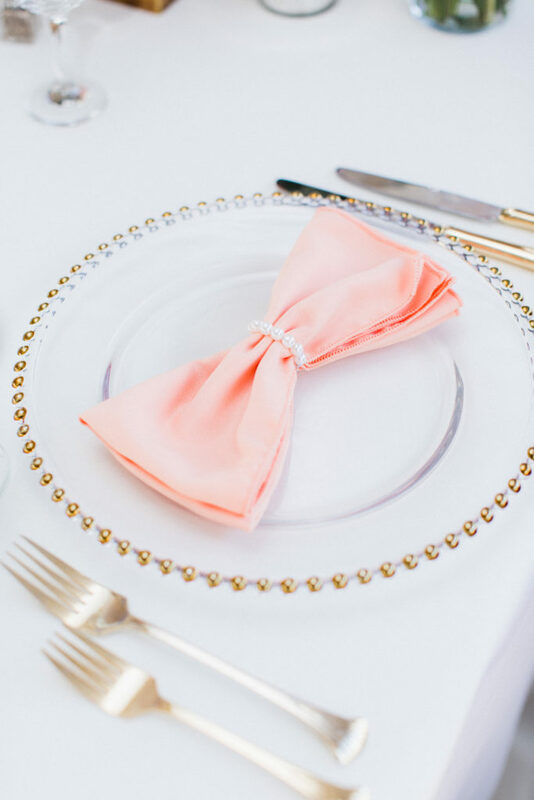 You guys know how much we love a good napkin, and these bright coral ones did not disappoint at this summer wedding! Napkins can really bring a table together, especially if you have a more neutral linen as the base. If you’re looking to add a pop of color without breaking your budget, napkins are the way to go! If there is one season to take advantage of pretty florals, it’s summer! 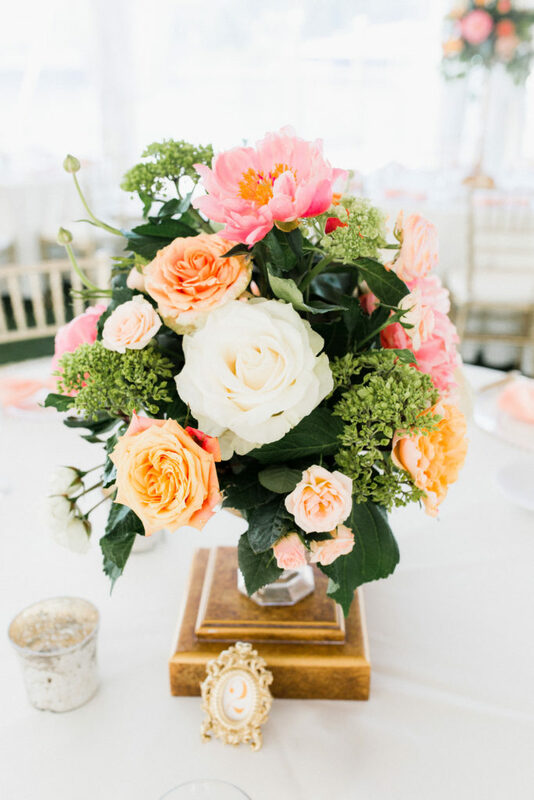 There are so many bright and beautiful flowers in bloom during this season, and your floral arrangements can really be “wow” statement pieces! There is nothing more fun than cute “getting ready” outfits for your wedding party! Robes are a popular choice, as they are super comfy AND look polished enough for photos! 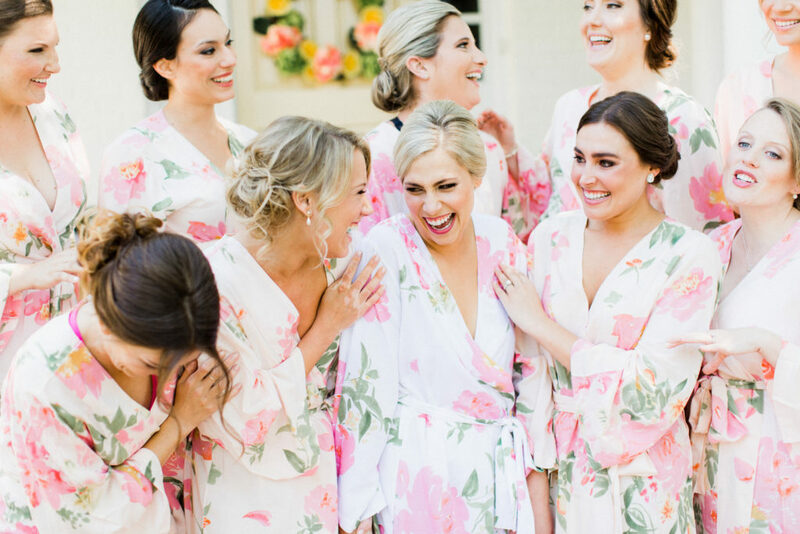 When we think of a summer wedding, colorful and floral robes come to mind! 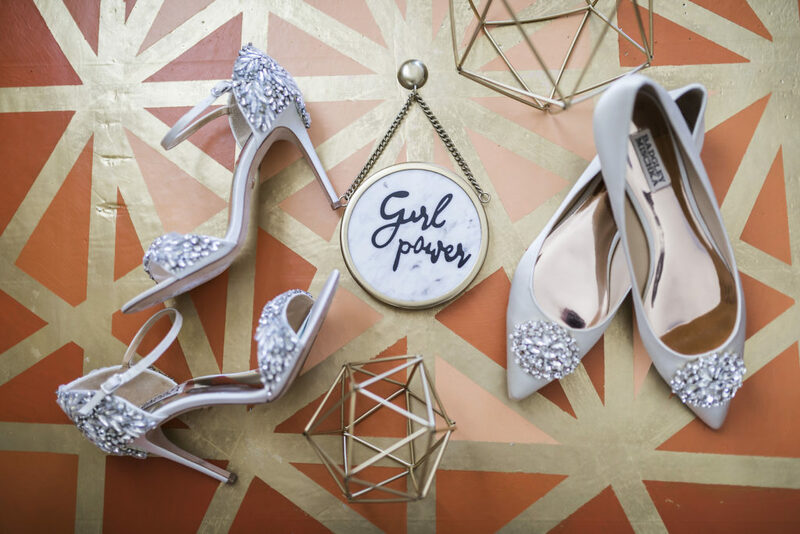 We were seriously swooning at this bride’s fun place cards! 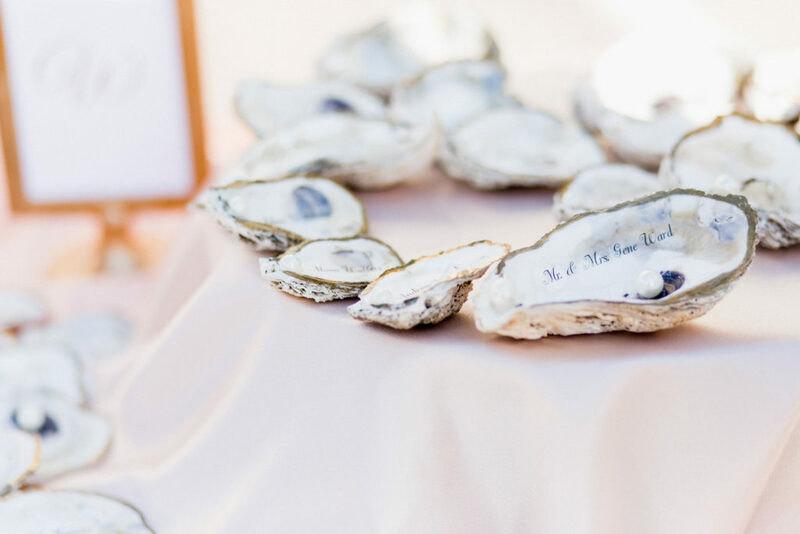 The oyster shells were the perfect addition to her on-the-water, outdoor wedding. We always love when the theme of a wedding can be brought into all aspects and design! 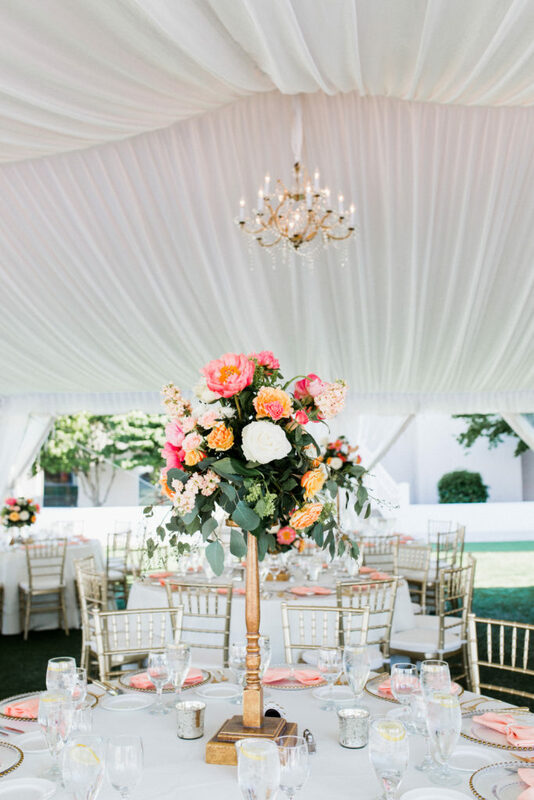 Tent weddings just give us all the summertime vibes! 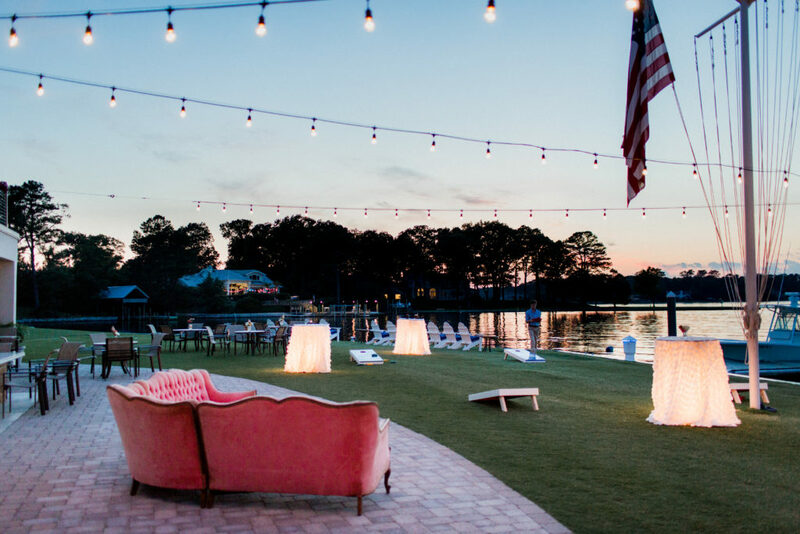 They are the perfect way to contain an outdoor wedding, provide privacy, and there are endless opportunities for decor! There’s nothing quite like a sweet summer night, right?! With the sun setting, an outdoor cocktail hour can be so beautiful! One perk to an outdoor cocktail hour is there is oftentimes more space for activities! 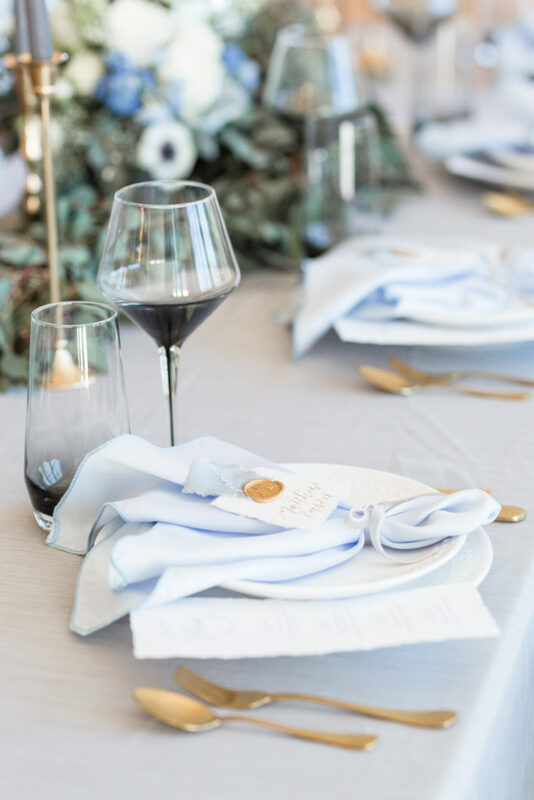 Although many of our clients come in for design consultations related to wedding linens specifically, we love when we get to help out with more intimate gatherings – like dinner parties! While there is a bit of planning involved when it comes to dinner parties, you shouldn’t feel overwhelmed or intimidated at the idea! We’ve rounded up a few helpful tips and processes that will make the whole experience feel like a breeze! Make sure that you have all the essentials you need! From table linens and napkins, plate chargers, chairs, and more – you don’t want to miss anything! Walk through your event from start to finish and make sure you have all aspects covered. 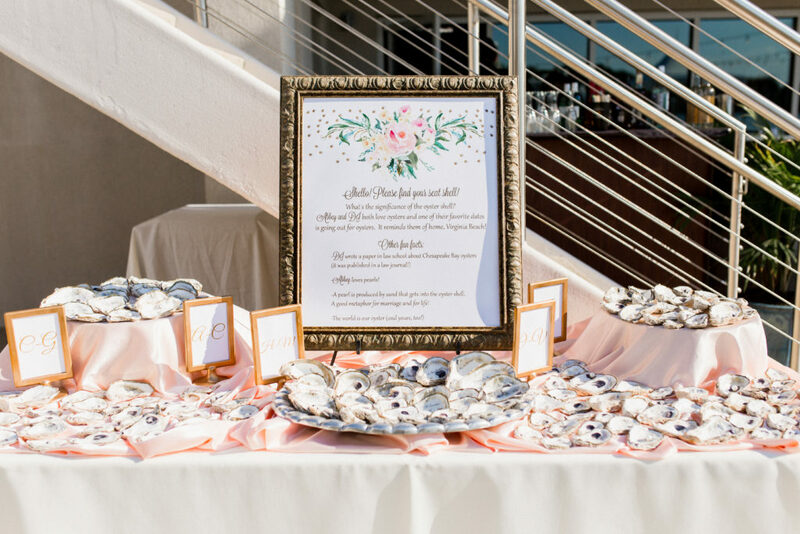 Feel like you don’t even know where to start when gathering essential linens and items for your event? Don’t worry, that’s what Waterford is here for! We are happy to set up a design consultation to think through the essentials of what rentals you need to make your party a success. Now it’s time to put your good taste to work! 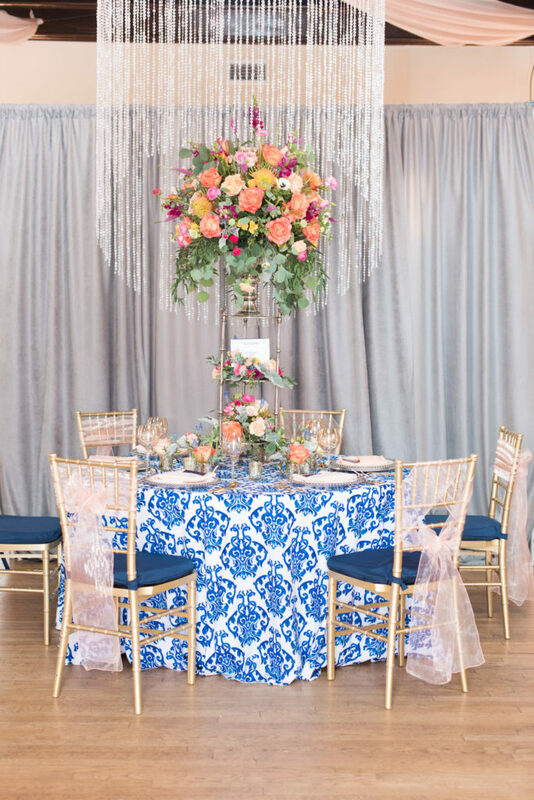 By this point, you’ve hopefully found the perfect linens, so now it’s time to incorporate your theme throughout with floral arrangements and other complementary design pieces! While you’re in the assembly process, make sure to keep your guests in mind. Do they have enough space to comfortably sit at the table? Do they have all necessary glass/flatware? When hosting friends and family members, remember that they want to enjoy this party as much as you do! It is ok to get creative and do something bold or different. Have you been dying to try out some different lighting options? Do it! Do you want to make a statement with a cool backdrop piece? Go for it! Whatever you decide to incorporate, it will be a great conversation starter and something unique to present! Last, but not least, it’s time to enjoy! Sitting back and actually enjoying the evening that you have carefully crafted is vital! Allow yourself to take a deep breath and actually look at the wonderful event you’ve assembled. Don’t worry about the little details out of place (that nobody will even notice!). Remember the reason you wanted to host the dinner in the first place: to celebrate with good people! If you haven’t heard the exciting news, we just recently moved office locations! We didn’t go too far, just down the street (literally), but we now have so much more space! With all of this new space, we are excited about expanding our napkin wall. 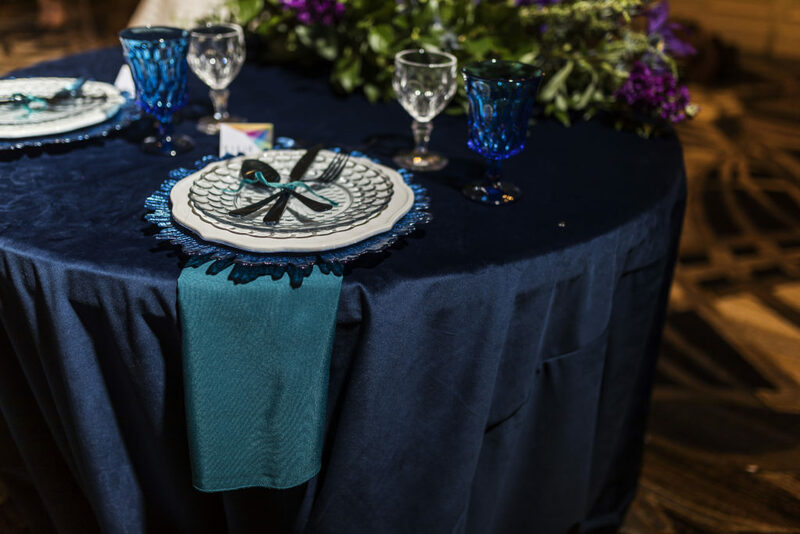 Napkins are one of our favorite ways to add a pop of color or extra detail to a table design, and we are pumped to have more space to see all of the napkins at once! For the most part, napkins are inexpensive and can really make a huge difference on your tables – small investment, huge impact! We’ve done a couple of posts in the past on our love for napkins, like the different folds you can create, some napkin inspiration, and why they are a great investment! So today we thought we’d discuss another important element of napkins: choosing the right/best kind for your event! It’s true that napkins tend to be on the more inexpensive side of linens, but it’s important to make sure you are getting good quality napkins! While napkins are a beautiful addition to tables, they aren’t just there for looks! The right napkin should make guests feel comfortable knowing that they can clean up after themselves and wipe up any accidental spills as well. Another good thing about having quality napkins at an event is that they can match the rest of your decor impeccably to add to the atmosphere. Though it may seem like a small detail, knowing you have best quality napkins at your event is vital for the success of your occasion! 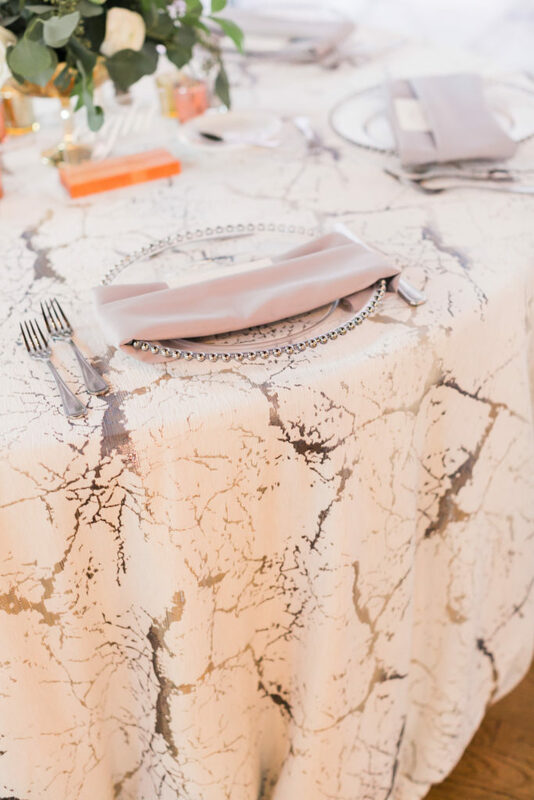 When you’re choosing event napkins, it’s important to figure out if you’d like napkins that are strictly for decor or napkins that are both fashionable and functional (we suggest option 2!). Functional napkins like polyester & satin make for easier clean up, while decor napkins (like sequin!) add a luxurious design element, but aren’t very useful when it comes to eating! If you are looking for the best selection of event and wedding napkins, contact us! We have a large selection of different products to ensure your event is exactly how you imagined it. 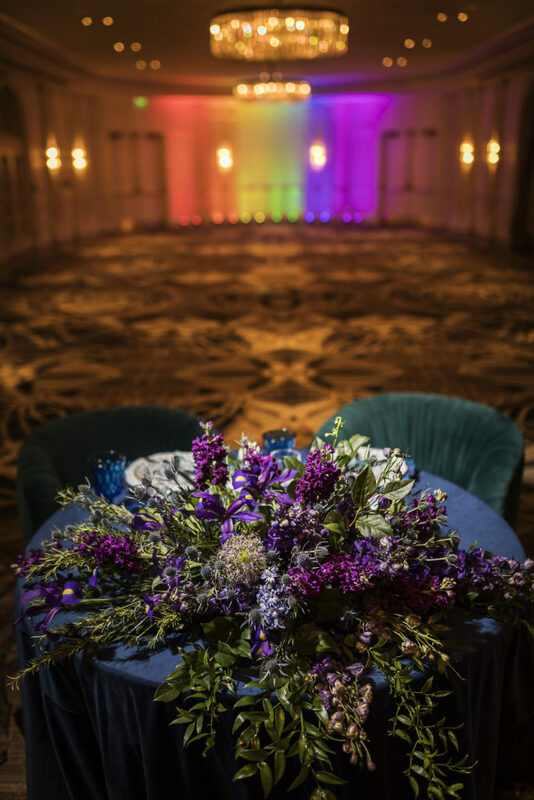 We’ve got a great post for you today filled with some ideas on how to incorporate one of our favorite color schemes into your event! 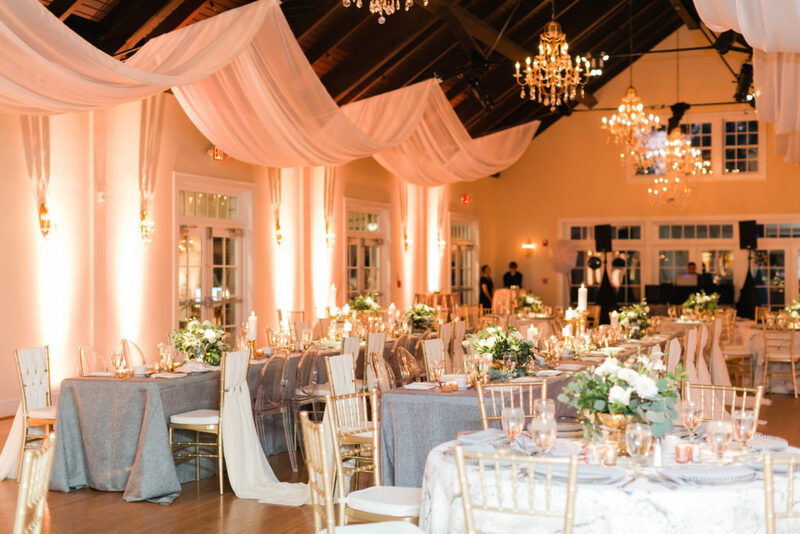 Using gold in your wedding design, whether it be the main color or not, is such an easy way to make your event look elegant and luxurious without breaking the bank! Check out 5 of our favorite ways to incorporate gold into your decor/design below! We absolutely adore this specialty linen of ours, and wouldn’t it just be the perfect way to add a touch of gold to your table?! We love how you can play around with this gorgeous linen to get just the right amount of gold that you’re looking for. This linen would definitely be the talk of your event! 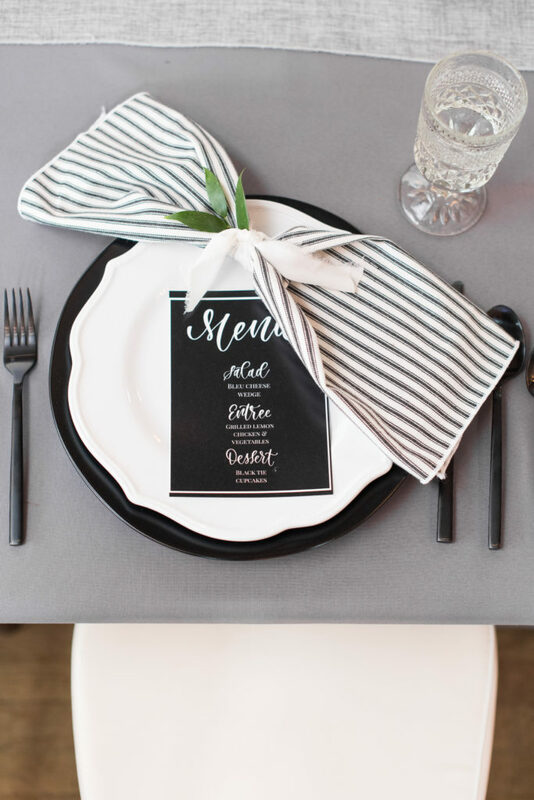 Wedding decor is all about the details, and no formal, sit-down dinner is complete without a little additional decor! To add a little something extra (in gold!) our gold beaded chargers are the way to go! The glass adds a modern approach to the charger, while the gold beading provides that perfect hint of color that could take your table design to the next level! 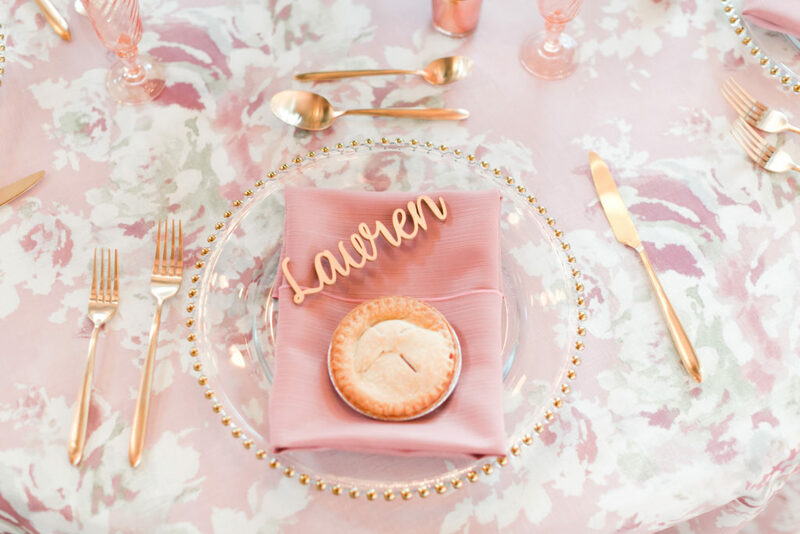 There’s just something so elegant about gold, especially in silverware and napkin form. Your guests will be pleasantly surprised to see beautiful gold napkins folded in an intricate design at their seat, or the unique look of gold silverware! Both items are the perfect way to complete a table design for an unbelievably low price! 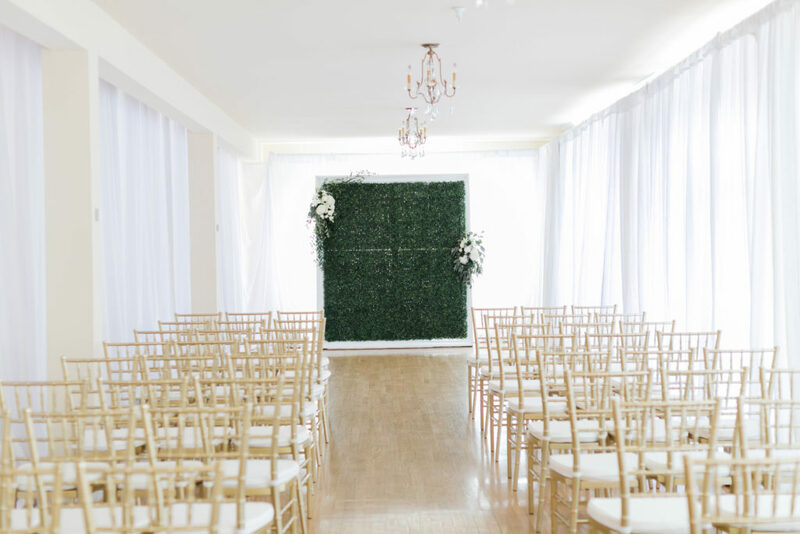 For a complete look at a ceremony or reception, our gold chiavari chairs are the way to go! We love how uniformed and elegant they can make rows of seating look at a ceremony, and they bring just the right pop of gold most people are looking for at a reception! Of course we can’t leave out a gold table linen of some sort! 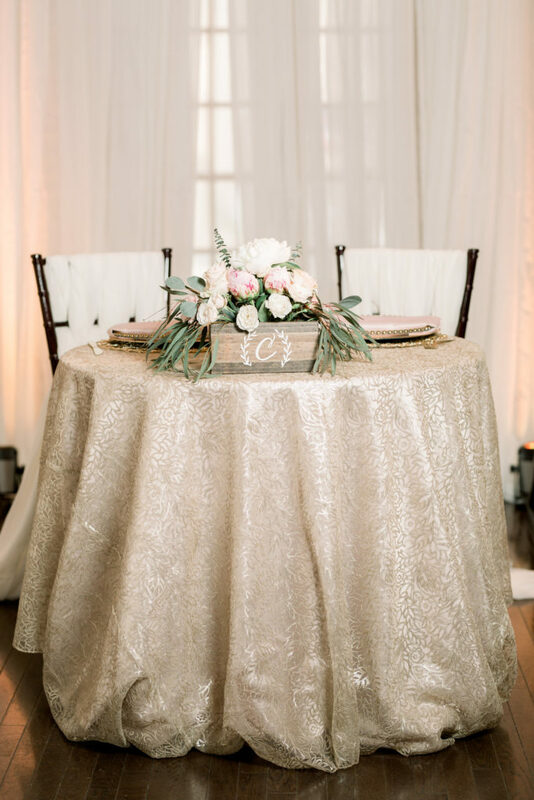 We love our beautiful gold leaf runners and overlays on guest tables, sweetheart tables, dessert tables, literally everywhere! The ideas are endless with this beauty! 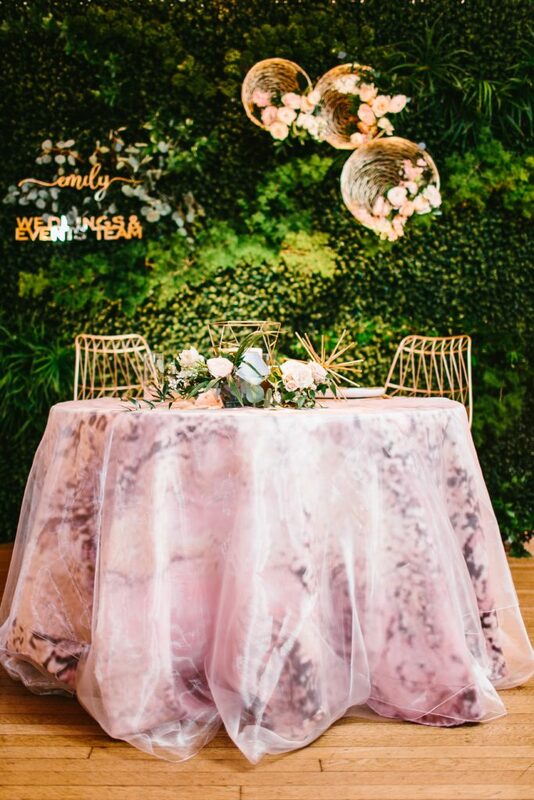 Today is all about a wedding trend that we are absolutely loving, backdrops! Backdrops are the perfect piece to add a “wow factor” without looking too busy at your wedding. 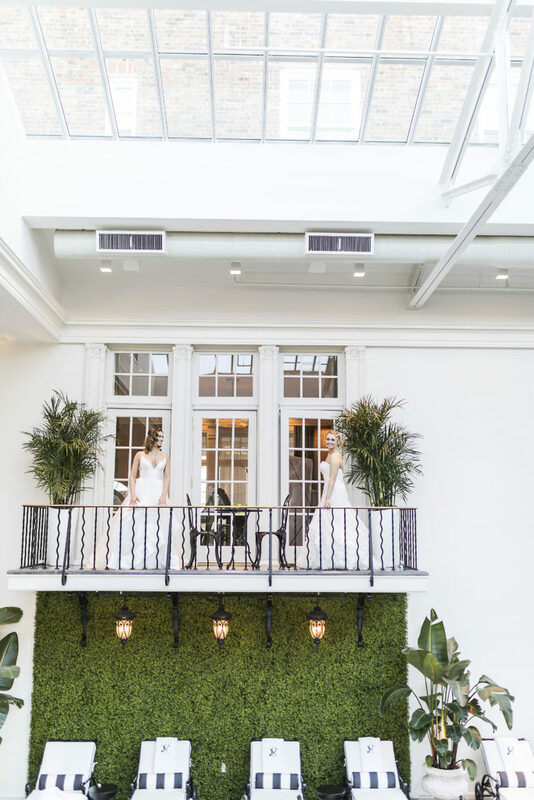 We’ve seen these beautiful pieces used during the ceremony, behind the sweetheart table, and even as a photo booth backdrop! Check out some of our favorite backdrops below! Remember when we blogged Rebecca’s wedding a couple months ago? 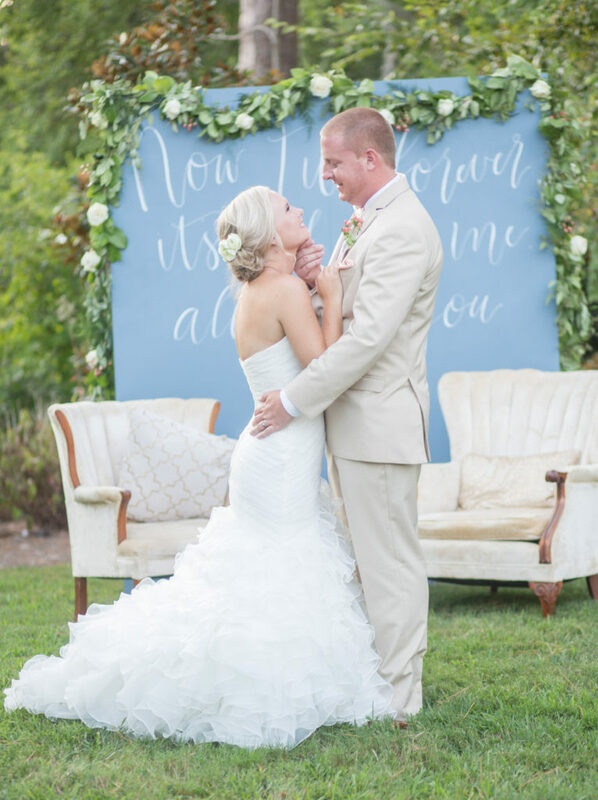 You got a little glance of the amazing backdrop she had, and we are still obsessing over it! 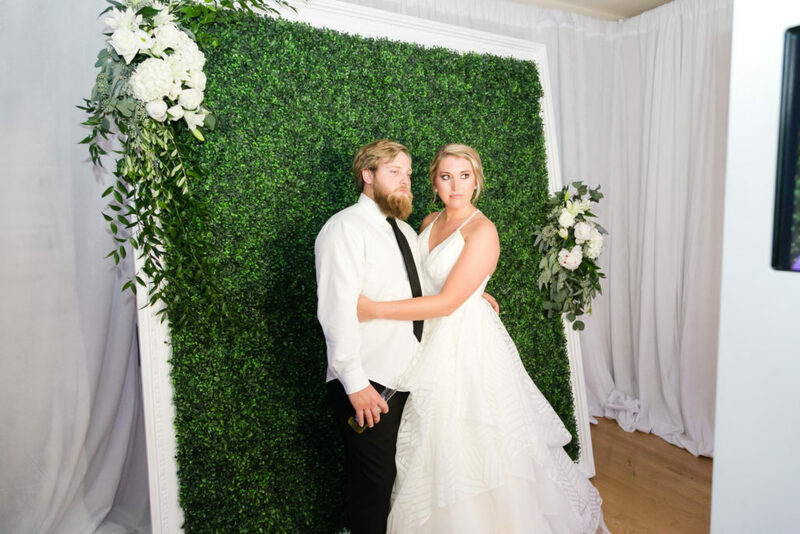 This particular backdrop took on double duty, serving as the ceremony backdrop and then as the photo booth backdrop during the reception. What an awesome idea to get maximum use out of such a gorgeous piece! This beautiful backdrop is actually from a Women’s Club of Portsmouth wedding a couple years ago! Featuring the lyrics from the couples first dance song, this stunning backdrop was the perfect seating area for guests! 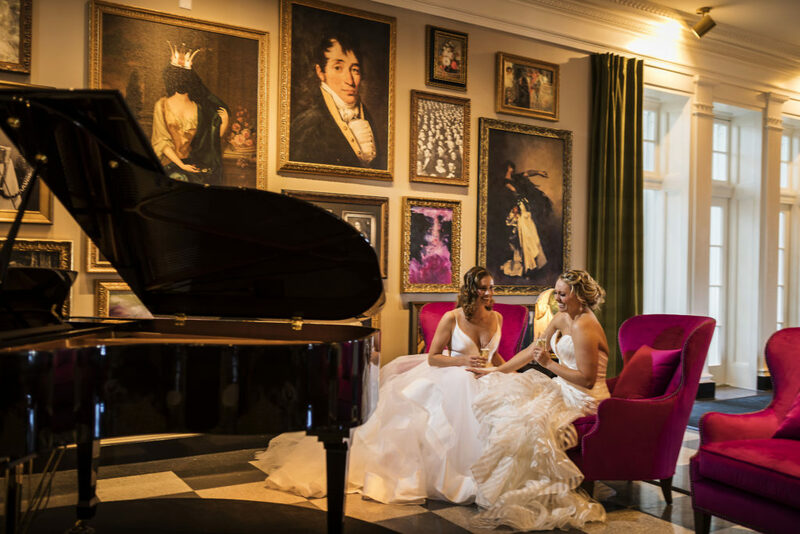 The bride and groom also got some beautiful portraits in front of it as well! The backdrop for this recent Winter Wedding styled shoot gave us serious inspiration! 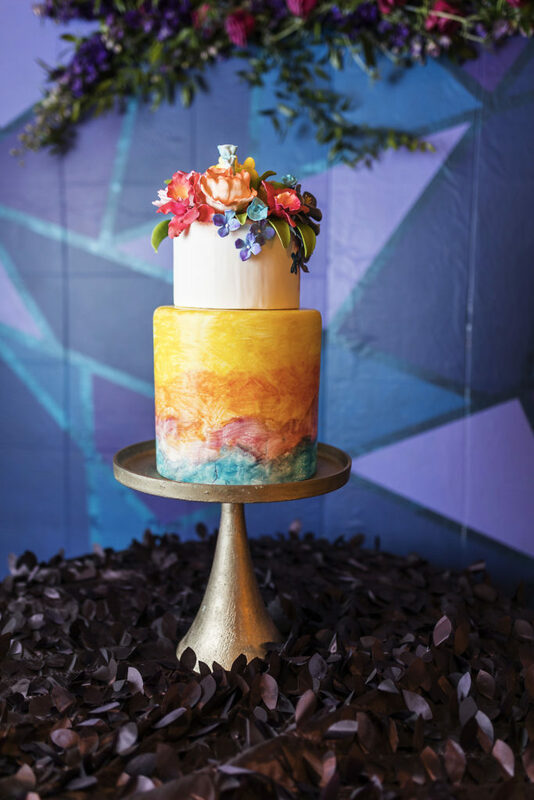 How gorgeous would cake cutting pictures be in front of this backdrop? 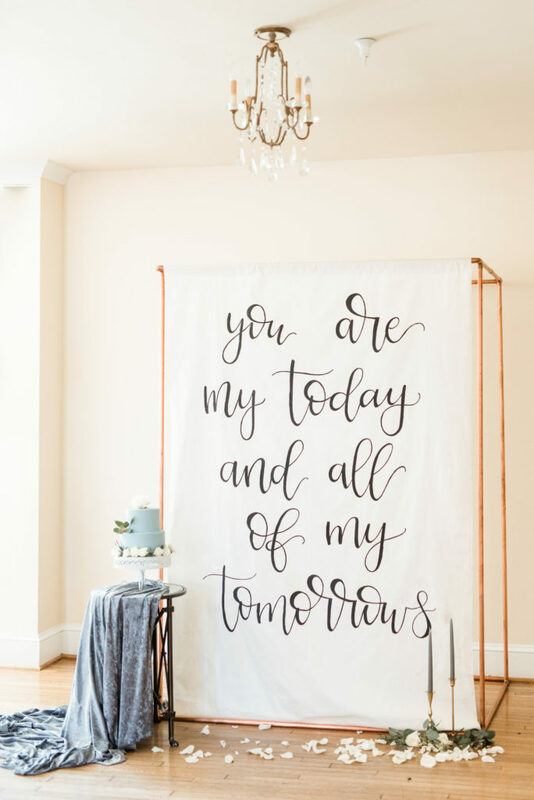 Having your wedding favors on a table in front of this backdrop would also be a super cute idea!